The Killer 7 Argument -noun- the reason and reasoning that despite a video game’s flaws, inconsistencies or other failings the overall package is so utterly unique that it simply must be played for the sheer experience. First coined by Ben “Yahtzee” Croshaw. This is the beginning of a new series whose purpose is to highlight the positive aspects of a game that would fall under the Killer 7 Argument and to explain why it fits the definition. This is mostly for games that have been overlooked, but any game fitting the definition is up for evaluation. 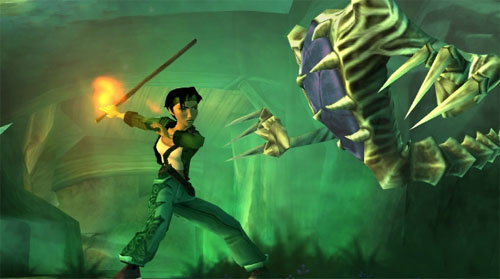 For the first iteration I’m going to do Beyond Good and Evil as if you couldn’t have guessed. It was recently the subject of a simultaneous play through by the Vintage Game Club over at Brainy Gamer. Beyond Good and Evil definitely falls under the Killer 7 argument. It has been called a Zelda clone and in fact has even been called a Zelda for grownups. I’m not sure either of those monikers due it justice. It has many of the elements of a Zelda game: environmental puzzles, dungeons, upgradeable equipments, but there is so much more going on here. First of all it changes the set-upÂ slightly so we are no longer stuck with a silent protagonist and that protagonist is no longer male. However, the game defies our expectations once again by having Jade not be your standard female protagonist. In other words, she looks like a real human being rather than being some sexed up object to be ogled at and in doing so, ironically, is a far more attractive avatar. Upon replaying it for the Vintage Game Club many subtle design choices came up in the discussions and revealed that create a simplified experience with the controls. Most of this was noticed early on, because the game doesn’t change its control scheme ever. It has a simple set of unified controls that transition from one mode to another. From this point of view, the R2 button is not the run button, but the move faster button. The hovercraft and the spaceship both use the same buttons to maneuver as Jade does on foot. On the PS2, the X button will always be action, the O button will always be item and the Square button will always be attack. I never noticed until it was pointed out why Beyond Good and Evil was such an easy game to control. The story is original and the characters refreshing in an industry filled with derivative plots and characters that seem to fill the same shoes that they could be interchangeable. The relationships between the characters feel believable and you under up caring what happens to them and Hillis, the planet they live on, beyond just an avatar to get you to the next dungeon. The camera mechanic as well is a refreshing gameplay element that is not a gimmick, but central to the progressing through the game. It is introduced early on and in a believable manner that it does not feel like a tutorial at all. In fact the entire beginning section is really a disguised tutorial section and maybe one of the better introduction to a game’s mechanics that I’ve ever seen. All the controls are discernible from the HUD and new controls are delivered through in-game dialogue in a natural and motivational way. By the way, the voice acting is really good. This is something that usually gets looked over in most video games, but each actor here brings their character to life, especially Jade, Pay’j and Peepers. The art direction is a nice set of blues and greens is beautiful even without modern top of the range graphics. 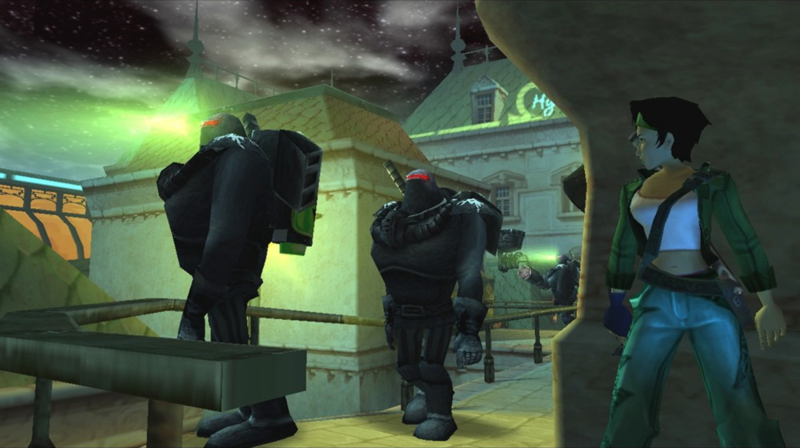 The cartoon style allows the player to get closer to the character than had it been hyper realistic. In either case it’s a nice change from gray and brown. As much as I like the game as a whole there are many problem areas, most of which I’m sure came about from the fact that Michel Ancel, was rushed through the game’s development near the end and was forced to make cuts and not properly test the whole game. The plot while a refreshing change does begin to become more obscure and is difficult to follow without paying very close attention to optional dialogue and some extrapolation. Beyond just that there are some major plot holes. Character’s supposedly in suspended animation are able to call after a few weeks while in captivity, injuries that would put someone out weeks are up and about when you leave the bar, and why the bad guys are going through all this trouble in the first place. The ending is an exercise in Indigo Prophecy Syndrome and while the credits leave an impression of what happens afterwords the little clip after that were clearly intended for a sequel that the game really didn’t need. I have said before that BG&E is in my top 3 of best chase sequences of all time in video games and after replaying it I stick by that assessment. There is no blur effect that makes it feel even faster like in Burnout and the camera doesn’t shake like in the Bourne series. Instead the slow pace provides a greater sense of danger and therefore a greater sense of urgency. I don’t want to spoil it, but when those sequences come up you’ll understand what I mean. The side dungeons are really short and aren’t necessary to completing the game for resources like they might be in other games. They are short and in most case extremely easy to the point of being jokes. The gameplay is varied enough that to be interesting to the very end, but the game is short, real short. It’s only about 10-12 hours if you spend time doing all the side dungeons and extras. But that isn’t a bad thing. The game is long enough to do what it needs to do and doesn’t overstay its welcome. Plus if you are rushing through the game you are missing a lot of what makes BG&E so great, the fine detailing. The day shifts from morning, noon, evening and night with regularity and the world’s inhabitants respond accordingly. Looking up at the night sky you find your camera identifying constellations. They have nothing to do with game other than being there. Plus the wildlife that abounds in the game is not just monsters there to kill you, but give the impressions of a breathing and thriving ecology. Does the game have issues? Yes. Is it for everyone? I can’t think of a game that is. But with all that it falls short in, it does so much else right and different than you can’t help appreciate it. I do wish it had more time to tighten up what was there and add what could have been, but as an entire package it is worth a play through. I do have a warning for you. The game can be purchased on Steam, but I would hesitate against getting that version. Many complaints pooped up about difficult controls that did not exist with the people who played the console versions. It wasn’t poor coding, but that the analogue sticks were very necessary and the keyboard wasn’t a good substitute for several sections. If you have no other choice I still recommend playing this game. One Response to "The Killer 7 Argument – Beyond Good and Evil"